Recently I created a Teespring account. For a long time I've wanted to create an apparel line that would donate a portion of profits to a suicide prevention charity. Well, now I've done it! The quote on the shirt comes from a poem I wrote a few months back. It's a reminder for anyone who feels less than worthy because of doubters in their life. What I've come to find true is that most of the time the doubters and non-believers are our own family and friends, not just our foes. The apparel ranges from t-shirts, long sleeve shirts, hoodies, tank tops, totes, and mugs. The campaign will run for 22 days only and 25% of all profits will go to the American Foundation for Suicide Prevention! I wanted something that would honor those who once felt the way we all have and ended it based on that false belief. I will do more campaigns like this in the future. Let's hope for a successful campaign! It ends on January 16th! The 1st short story to "My Interpretation: Short Stories Derived from Songs" is now up on Wattpad. Please read it, vote and leave comments. The short story is called "Dangerous Love" and is inspired by Ariana Grande's "Leave Me Lonely" featuring Macy Gray from her "Dangerous Woman" album. It's a story I am very proud of and I mentioned before these stories are like music videos on paper but more in depth. They are what envision in my mind when listening to a song. Click the title below to read "Dangerous Love." Dangerous Love: Inspired by Ariana Grande's "Leave Me Lonely"
The last time I wrote anything on this blog was back in June when I shared that I started an organization called Jumping Waves. After that I got really caught up in planning my wedding (yes, I got married! ), being apart of my sister's wedding and moving across the country (NYC to AZ). Now, I'm not exactly settled but I got tired of waiting. I felt the need to get back on my grind and start working towards my goals again. First off, SElleCameron.com got a new look and a new host! Crazy Little Thing Called Love is almost complete (literally like a chapter or two away from being done), My novel I wrote back in 2010, Smoke & Mirrors will get some attention from me by being reworked and released, not to mention Jumping Waves will be making some waves. These are my goals for 2017. Not to mention, I want to create a website for Wanderlust, my blog I started back in March that is dedicated to my travel affairs around the world. That will be reworked from scratch. I want to start video blogging as well but my webcam on my computer no longer works but this won't stop me. Hopefully sometime in the upcoming months I'll get around to purchasing one so I can get going. I'm currently wracking my brain trying to come up with new ways to reach more people. I don't desire anymore breaks and I want to keep it moving. NEW SHORT STORY ALERT! This one is extra special because it's going to be part of a book I am going to start working on very soon. It's connected with the A Tragic Heart series but is strictly told from Adalyn and Jackson's POV. Two supporting characters are being turned into the stars! She comes behind me and wraps her arms around my shoulders. She plants soft kisses on my neck, distracting me from time on my guitar. I place it to the side and she knows that’s her cue to take its place on my lap. “Are you sure you can’t stay the night?” she asks poking out her lip, already knowing the answer. “I gotta get back home to Megan. We’re working it out,” I reply in a defeated tone. “No need to explain. I know. We’re in the same position,” I say pulling her closer to me. Time on tour together turned into something neither of us ever expected. After I found Megan in bed with another man while our kids were asleep in the next room, I left for tour and never confronted my feelings. I was pretty down and out for most of the time but it was her who brought me back. She showed me a good time one night and that was that. I never meant for any of this to happen and neither did she. Besides, she had something going on with my sister’s ex-husband and she used to date the lead singer of her band, who is currently my sister’s husband and one of my closest friends. Complicated, huh? Not to mention, she’s now my sister’s best friend…in a way they’re like sisters so this makes it all the more complicated. These are the reasons it has to remain a secret. I’m a married man having an affair. I’m just as bad as my wife. After catching Megan in the act we separated for a while. My heart was intent on divorce and that’s when Adalyn and I started our fling. It was purely sexual at that time but I fell for her in ways I never imagined. It was her beauty, physical and internal. I poured my heart out to her one night and scared her away. She told me what we had was just for fun…nothing serious. It was cold and harsh; meanwhile my wife wanted to work it out with me so I gave into her. There was no point in being lonely. I mean, I still loved Megan, I just couldn’t look at her the same way, but I was willing to try. Long story short: when I was gone she realized she loved me too and now we’re here. After her confession we tried to avoid each other as much as we could but I had to give in. I wanted something new…someone who didn’t hurt me. With Megan it started to feel forced but with Adalyn it was all natural. She started as a friend and ended up being so much more. Everything was easy and it was just what I needed. Fast forward and here we are: loving each other in secret, afraid to let anyone know because of what they might think. “I’ll come by tomorrow night after I put the kids to bed. I’ll just tell her I’m utilizing some studio time solo,” I say caressing her arm. She’s ready for this to come out and in a way I am too. It’s just that I know the timing isn’t right. I haven’t wrapped my head around leaving my family for someone else. I mean, I would never abandon my children, they’ll always be a major part of my life and Adalyn understands that. I’m just not ready to take them through another separation knowing this time it’ll be permanent. I’m not sure how they’ll take having a second “mommy” around so soon. “There will never be a right time,” she corrects me. I see where this is going and it’s heading nowhere fast. I roughly grab her face and kiss her. She doesn’t seem to mind. I let go and stare into her eyes. The light quickly reflects off of them causing them to look a lighter shade of brown for an instant. “See you tomorrow?” she asks as if she’s uncertain that I’ll be there. She stands up and I follow her lead. I allow her to walk me to the door but I can’t help but notice that disappointing look on her face. I’m not trying to hurt her or Megan but it seems that’s all I’m doing lately. I touch her face one last time and she gets what I’m trying to say. I kiss her cheek and she smirks. “I love you,” I tell her once more. Please leave your comments with opinions and suggestions! Would you like to read a full novel on a secret Adalyn and Jackson could've possibly shared? Do you want more from the A Tragic Heart series? Sound off below! Suggest a friend to sign up and receive a free copy of A Tragic Heart as well! Just email me your friend's name after they sign up! I was given this idea when I received an email from an author whose newsletter I am signed onto. Given, this post was supposed to be written on the 11th, I had a busy past 10 days dealing with work, lost luggage, planning for parties, and a Grandmother who was in the hospital. Whatever, it's here now! It's okay to be different...like vastly different from your peers. I'm sorry I'm telling you this about 10 years too late but I didn't know it back then. You definitely should've dyed your hair the colors of the rainbow and embraced ripped up jeans and Converses instead of high heels and dark brown hair. You didn't have to change that because nothing was wrong with it. It's okay to be into bands instead of rappers even though no one made you feel like it was (but I'm glad you met someone who did!). Liking rock music and being deemed as "emo" doesn't mean you abandoned your culture even though that's what they told you. I really digged the dark eyeliner and bright red hair...it was so...YOU! No one had to understand you because you weren't meant to be understood. You were meant to be free and different. Your views matter and just because family and "friends" didn't share the same ones didn't make you wrong. You never had to fake what music you liked or the slang you couldn't speak. There's nothing wrong with saying "rad" or "awesome", it didn't make you any less black...it made you, you and you're pretty cool to me. I only wish I told you this back then but I'm telling you now. Go ahead and be who you are. I love it. I finally love you. Please leave comments, share, and like. Repost with a letter to your teen self or leave one in the comments below. What would you say to yourself if you knew back then what you know now? I know, I know! It's been over two months since the last time I posted anything but that's going to change because I have finally found a schedule that works for me. In the time that I have been away I completed my first children's chapter book, Madison Avenue and I created a new website that you can check out at SElleCameron.com. From now on, I will try to blog at least once a week and I am going to become more active via my social media pages. For those who know me personally, they know this is my biggest challenge because I hate social media. I know this sounds insane for a 24 year old who is also a public figure to state but I really do. I'm not good at socializing in real life and the same goes for cyber socializing. Sorry, but I was never the "cool" kid so I'm a but stumped at this part but I am going to make more of an effort. I have so many ideas for 2016 and the rest of the future that I'm extremely motivated to stay on top of my blogging and sharing. In fact, I plan to start a new blog entitled Wanderlust via my website that will chronicle all of my travels as I write a book of the same title that will feature personal journal entries, poems, short stories, and anything else I feel inspired to write about. It's a book that will aim at nothing yet go everywhere, hence the name Wanderlust. The blog will feature videos (I'm going to get over my fear of video blogging), photos, and excerpts from my personal travels around the world and USA. Traveling is big for me and I hope to start the blog as soon as next month while on my cruise from Miami to Mexico with my favorite band Paramore. Now that's something to share! So, remember to keep checking for me throughout 2016. I'm hoping to become more transparent as a public figure and reach people I never thought I could. Keep scrolling, clicking, and sharing! Hello all! 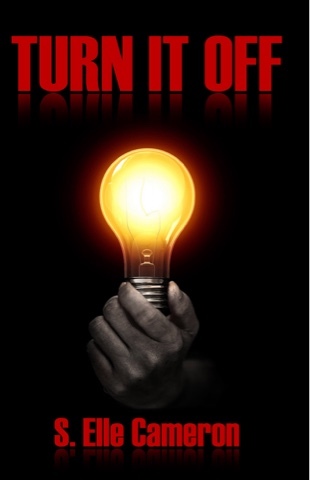 It's finally the month/week Turn It Off will be released. It's due out December 13th (this Sunday). The good news is I just received the digital proof from my publisher and it all looks good so far. I'm going to finish up some character profiles and have them up by Sunday so you all can check out the characters you'll be reading about. For now you can check out the last one here: /sellecameron/2015/10/character-profile-from-turn-it-off_23.html and the one before that is already linked in the that one.